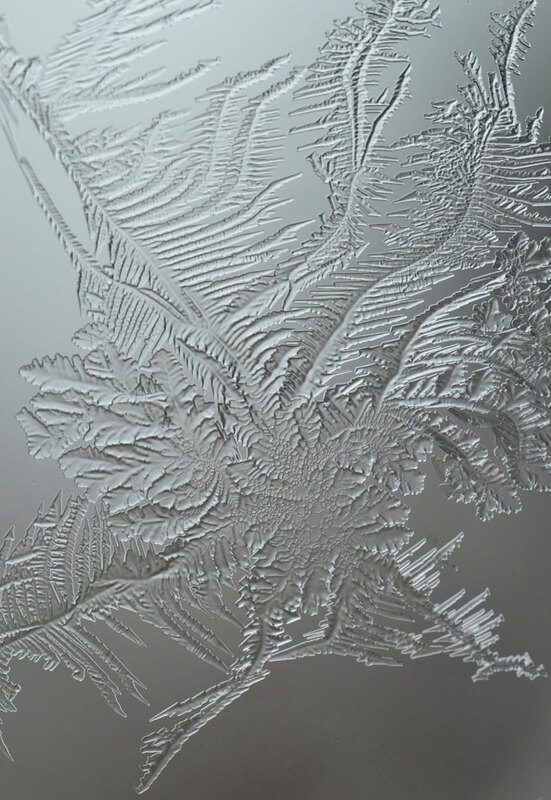 These are the delicate details of frost growth on a window. It has since warmed up here significantly and these icy apparitions have now vapourized but when I look at these images I find they are suggestive of elaborate gardens and graceful trees, Chinese landscape paintings and dragons. Wow, these are incredible – hard to believe! Hard to believe is well said. I’ve never seen anything like this. The frost is remarkable, isn’t it? I thought the same thing. It looks like beautiful foliage! You highlight the beauty of nature so well!! Thank you, Mimo. Yes, delicate foliage. Karen, your graceful choices in every decision, are impeccable. Spellbinding. I’m happy you think so, Elena; I have more frost to post! gave almost three dimensional depth, looks awesome. These are trapped between two close windows. Maybe that’s why they are more glassy looking. The frost does amazing things! Thank you, Yoshizen. Amazing! They look like lace even. It is amazing what mother nature can do! Great shots! Your eyes are absolutely artistic. Mother nature is very creative! Thanks very much for your comment. They remind me of other worldly ferns. What an eye you have Karen. You asked somewhere else about how cold it has to be for these to form. 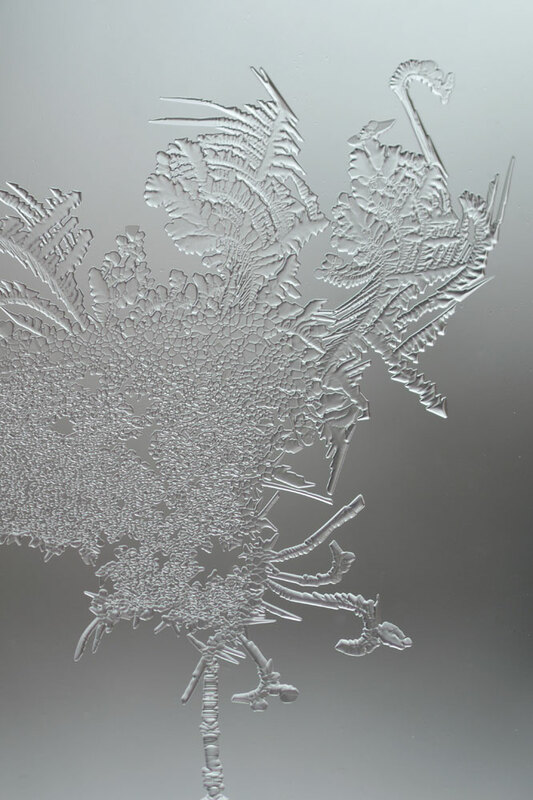 They seem to start forming on this window when it is about -15c. Beautiful, Karen. Mother Nature is certainly clever. Thank you, I agree, nature is clever! I just looked through many of your posts. Your photography is absolutely, stunningly breathtaking! Thanks for sharing! The formations are pretty amazing. I am luck to have a good lens for this sort of photography. These are so beautiful. I find some of the shapes similar to the windswept trees painted by the Group of Seven. Janet, that crossed my mind too.Thank you! Thank you, Nathan. They are certainly unique artworks. Karen, every time you post something, I know it will be amazing. But these shots exceeded my expectations by a lot. They are so delicate and lovely, and you captured that perfectly. And, knowing how quickly they were gone adds a degree of poignancy, too. Thanks for continuing to post such quality work! Melinda, thanks very much. It’s so nice to hear that you enjoyed these – I’ve new ones to post! I truly appreciate your comments. So beautiful Karen. Nature is a wonderful artist. As are you for capturing nature’s art so brilliantly! Thank you, Adrian. I am constantly amazed by nature myself. I love these, just great!!! No, I don’t suppose you see much in the way of frost there! Thanks for your comment. That hadn’t occurred to me but i can see what you mean. Thank you. These are truly stunning, Karen. You have photographed them with great skill, portraying their elaborate and graceful form to full effect. Would love to see these as prints – thanks for posting. Thanks, Simon. They would be interesting blown up really big to show all the details. I’m glad to hear that! Thank you. 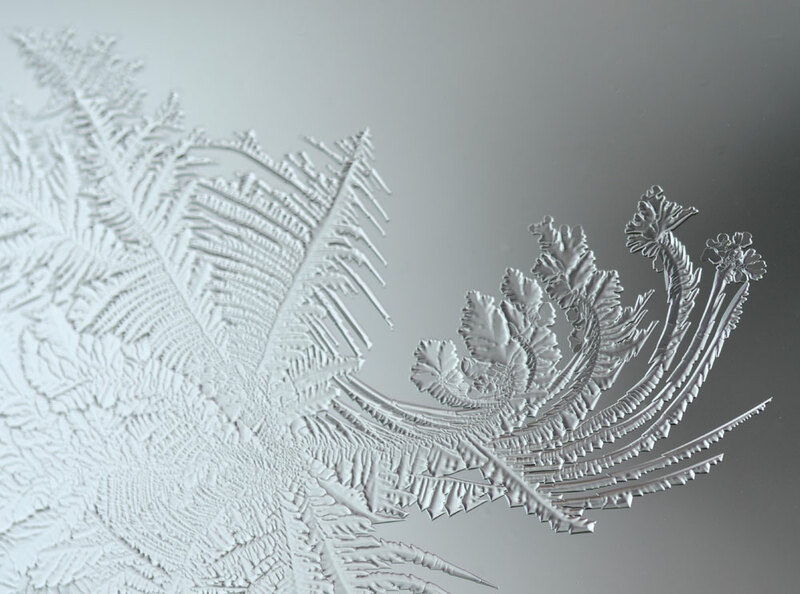 Like intricate glass engravings! Ah, the things we don’t see! They are like glass engravings, aren’t they? Thank you! I like that association. They do seem other-worldly. I find your work to be absolutely beautiful! The fine details you find and the way you capture them are sensational. A great source of inspiration. Stunning! That’s very nice to hear. Thanks very much, Astrawally! Fearsome dragons, delicate swans, hoarfrosted forests–alternate realities etched by worksome sculptors into an unsuspecting window. Alternate realities, for sure. I’m glad I’m not the only one who sees dragons! 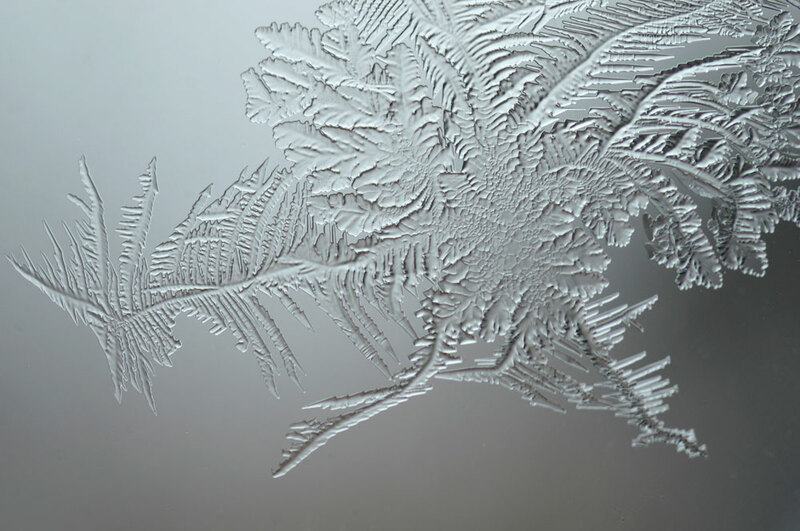 Lovely photos – nature mirroring nature, ice crystals embossing ferns on a window. Amazing. Nobody etches like Mother Nature. Very fractal too. Outstanding shots, Karen! You are right, nobody does work like mother nature! Thanks, Greg. These are beautiful. They look like all the things mentioned above and also they look alive and growing. And I just noticed my own dirty windows and winced. I confess that I did remove a couple of dirt spots from these – my windows need cleaning, too! Thank you, Anna. Hi Mufidah, thank you. These were photographed with a Nikon D7000, and a 1:1 macro lens. These formations are not all that big so a macro lens is needed. Are you set up with a new lens yet? Thank you, Phil. Nature makes the best art. Transient formations – here today, gone tomorrow…Well captured! So beautiful – its as if nature has just let its imagination flow, and you have captured it so beautifully. And what an imagination it has. Thanks, Anna. They look like the work of a very fine abstract artist, etching on glass. Wonderful! Thanks, Richard. The details are really quite amazing! Absolute beauties!! I’m constantly in awe of nature – we can only attempt to imitate it can’t we..a stunning find Karen..
Hi Cath, yes! Me too – in constant awe. Thank you. Terrific! So much like foliage. And very reminiscent of a brocade or similar textile imitating foliage. Yes, they are much like brocade with foliage. That had crossed my mind, too. That is amazing artwork. Created by natured, but seen and captured by you. And beautifully so. 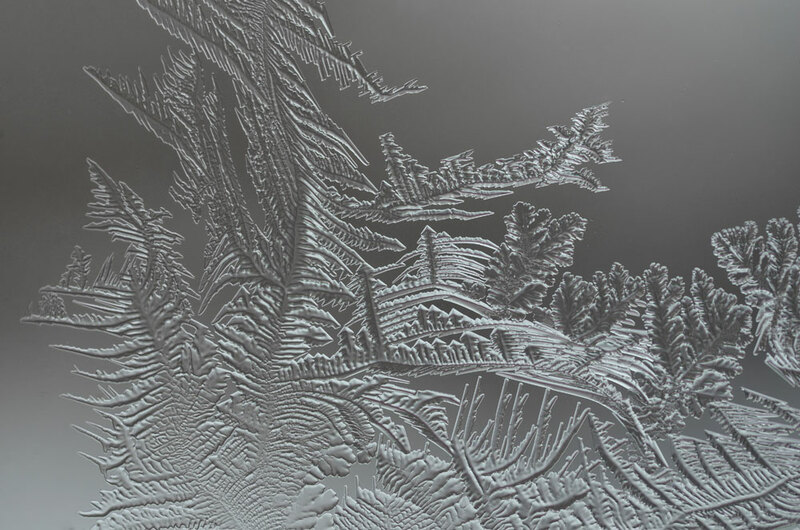 I can see all kinds of creatures in those frost details. Wonderful. Thank you, Otto. I can see all kinds of things in these, too. Nature is astonishing! These are incredible!! Absolutely exquisite!!! They really are amazing formations. Thanks, Marcie. They really are their own tiny works of art. Thank you, Emily. These are gorgeous Karen; they literally took my breath away, I couldn’t believe how I inhaled and stopped breathing for an instant as the first image came up. That’s not something that happens to me very often. Wonderful eye to see these and then capture their essence. What a great response, Nick. The formations kind of blow me away, too. I keep photographing new ones as they thaw and re-freeze in different ways. Thank you. Karen, you should have a show with these… ! They would be interesting printed large, wouldn’t they? Thanks for the suggestion! Truly beautiful… I love the swirls and shapes….. you know, your photography always makes me want to grab paper and pen and draw!! Your drawings are always gorgeously inspiring. Thank you, Moofie! Beautiful captures! They look embossed. Nature is such a fabulous artist! Yes, nature is stunning. Thank you. 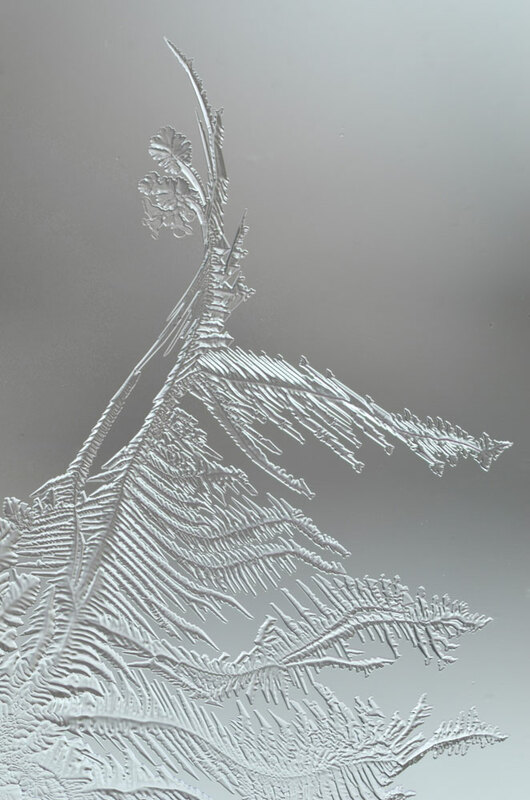 They look like glass etchings, Karen…crazy beautiful…. Crazy beautiful – I love that. They really are amazing formations. thank you! Wow Karen, this is absolutely amazing and beautiful ! Wow and re-wow ! They are fascinating formations, aren’t they? Wow! 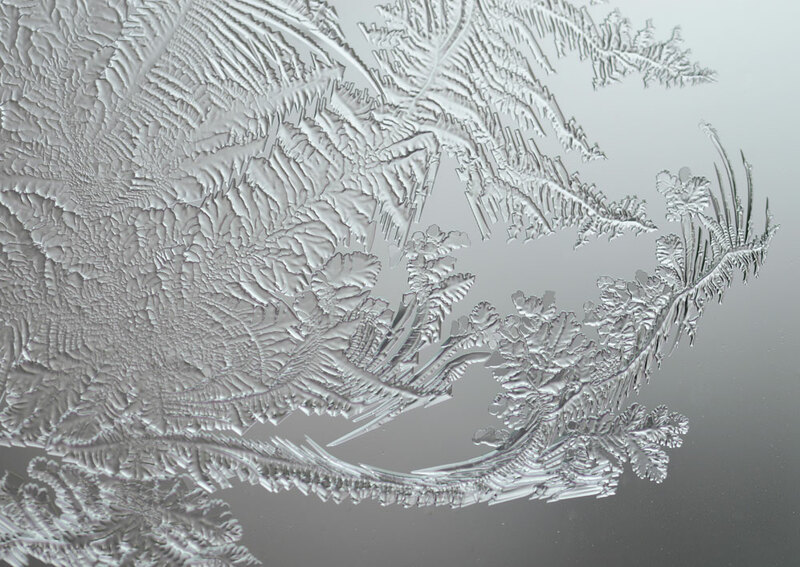 This set is even better than your previous selection of frost on windows! 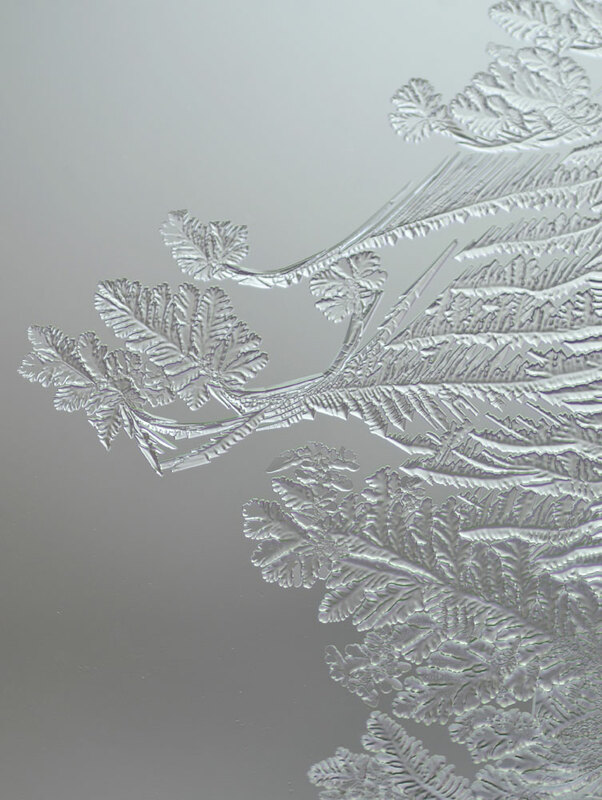 These really do look like an engraver has been at work on frosted glass! Once again, I have never seen anything like these, Karen! Wow! A little more of natures magic, John. Thank you. They really are quite fascinating. Thank you, Helen. Yes, finely detailed formations – they are very small.